This book covers random signals and random processes along with estimation of probability density function, estimation of energy spectral density and power spectral density. The properties of random processes and signal modelling are discussed with basic communication theory estimation and detection. MATLAB simulations are included for each concept with output of the program with case studies and project ideas. 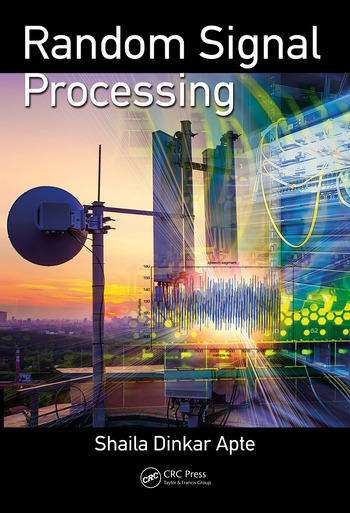 The chapters progressively introduce and explain the concepts of random signals and cover multiple applications for signal processing. The book is designed to cater to a wide audience starting from the undergraduates (electronics, electrical, instrumentation, computer, and telecommunication engineering) to the researchers working in the pertinent fields. • Aimed at random signal processing with parametric signal processing-using appropriate segment size. • Covers speech, image, medical images, EEG and ECG signal processing. • Reviews optimal detection and estimation. • Discusses parametric modeling and signal processing in transform domain. Dr. Shaila Dinkar Apte is currently working as a professor on PG side in Rajarshi Shahu College of Engineering, Pune and as reviewer for the International Journal of Speech Technology by Springer Publication, International Journal of Digital Signal Processing, Elsevier Publication. She is currently guiding 5 Ph.D. candidates. Eight candidates have completed their Ph.D. under her guidance. About 70 candidates completed their M.E. dissertations under her guidance. Almost all dissertations are in the area of signal processing. She has a vast teaching experience of 35 years in electronics engineering, and enjoys great popularity amongst students. She has been teaching Digital Signal Processing and Advanced Digital Signal Processing since last 22 years. Her previous designations include being an Assistant Professor in Walchand College of Engineering, Sangli, for 27 years; a member of board of studies for Shivaji University and a principle investigator for a research project sponsored by ARDE, New Delhi. Dr. Shaila Dinkar Apte completed her M. Sc. (Electronics) from Mumbai University in 1976 and acquired the first rank. She then received her M.E. (Electronics) in 1991 from Walchand College of Engineering, Sangli and Ph.D. in 2001 in Electronics Engineering from Walchand College of Engineering, under Shivaji University, Kolhapur. Her Ph.D. thesis involved work on speaker modeling using optimal mother wavelet. She has published 28 papers in reputed international journals, more than 40 papers in international conferences and about 15 papers in national conferences. She has a patent granted to her credit related to generation of mother wavelet from speech signal. Indian patent related to emotional speech synthesis is published. A book titled "Digital Signal Processing", "Advanced Digital Signal Processing" and "Speech and Audio Processing" are published by Wiley India. A second reprint of second edition of the first book is in the market. A book titled "Signals and Systems-Principles and applications" is published by Cambridge university press. Her areas of interest include emotional speech synthesis, emotion detection and context based personalized speech synthesis.